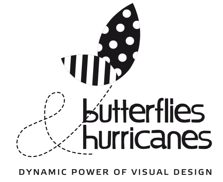 Butterflies & Hurricanes is a female-led, highly creative and dynamic packaging, branding and graphic design firm in Prague, Czech Republic. The company is based at Polska 54, Praha 2, on the same street as Prague College's main campus. The company's female-led approach is guided by the four I’s: Intuition, Insight, Inspiration and Innovation. Butterflies and Hurricanes have the knowhow and the empathy to initiate and maintain brand relationships with the widest possible range of consumers; they encourage and guide their clients toward deeper design thinking, greater customer-centricity and brand storytelling while remaining savvy to the current market conditions and the rapidly changing world of retail. The company is concerned for the environment and the future of the planet. Not only because sustainability is one the fastest growing trends in industry, but because it is the right thing to do. Their goal is to be that butterfly whose wings are the starting point for a hurricane of positive change that sweeps the world.